India - the land of blinding colours, incredible smiles, honking cars, warm people, littered streets, mighty Himalayas, naked hermits, a million gods, gorgeous women and spicy food. All of us have heard these comments about this indescribable and bewildering country, I call home. One has to experience it to understand what I mean - you either fall in love with it or simply loathe it. There is no mid-way. I was born here and grew up in various different regions which gave me a chance to get to know my own countrymen speaking different languages, clothing themselves in different attire, following different customs and cooking some really awesome traditional meals. I honestly don't know what is essentially Indian food because there is a new cuisine in every Indian state. The north is all about fresh spicy curries, the south relies heavily on coconut based curries and rice preparations, the east has lot of sea food and meat preparations whereas the west offers lots of fried snacks. However, there is one thing that binds all Indian food together - the Indian spices. 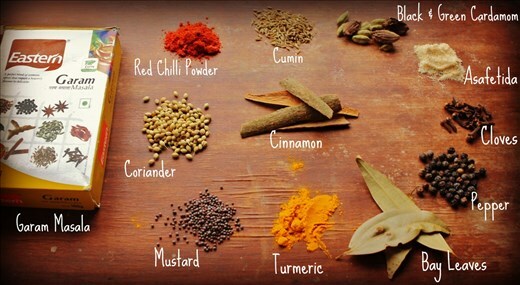 Before sharing some recipes, let me introduce you to some basic spices found in every Indian home. These spices when used in different combinations can pretty much prepare 95% of Indian home food. These spices have been used through history not only for flavour but several health benefits like improving digestion, detoxifying, providing vitamins, strengthening immunity and some even as aphrodisiac. Cumin Either used whole for tempering hot oil or as powder to bring out strong aroma & distinct sweet flavour. Coriander seeds A whole spice and comes from the same plant as fresh green coriander/ cilantro herb, but two have different properties so must not be interchanged. Coriander seeds are normally used in powdered form and act as a coolant. Black mustard seeds Used for tempering hot oil and has a distinct but very pleasant flavour. Turmeric Used for its natural yellow colouring properties and ginger like mild aroma. Red Chilli Powder Adds slightly pungent aroma, heat and extra kick to the dish. Asafetida It has a strong odour and taste when raw. However, once added to oil or the dish it's flavour instantly changes to sweet-garlicky. Green & Black Cardamom Used to give very nice flavour and aroma to various Indian dishes. The pod itself is bland, its the seeds inside which hold all the magic. Cinnamon Added in Indian curries, rice dishes etc to offer warm and sweet flavour. Cloves Add a strong pungent and sweet flavour to the food. Pepper Adds pungency, slight heat and bite to the food. Dried Bay Leaf Adds a warm aroma to the food. Confused? Don't be. I am going to give away an easy way to Indian Spices, used in every single household: Garam Masala. Some people make it themselves at home but most buy it from the food store. Garam Masala is typically a powdered mixture of coriander seeds, black pepper, cumin seeds, dry ginger, cinnamon, aniseed, cardamom, cloves, nutmeg and salt - the ingredients and their ratio can vary slightly from brand to brand. So, the TOP 5 Spices you need in your kitchen for Indian cooking are: Garam Masala + Turmeric Powder + Coriander Powder + Cumin Seeds + Black Mustard Seeds. That's it ! It will sail you through many Indian dishes. 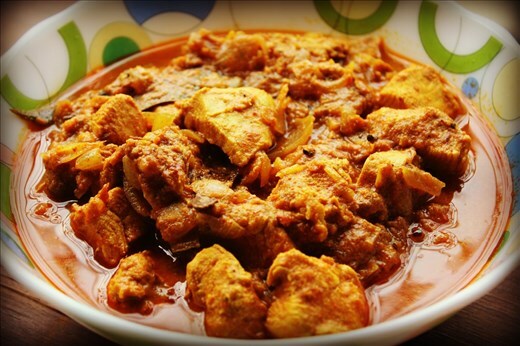 Now coming onto the recipes, I am sharing one for a homestyle Chicken Curry, by far, the most easily recognised and popular Indian dish around the world. Also, one for a quick Indian snack - Onion Pakoras (onion fritters). They both are easy to cook, with simple ingredients and as Indian as they can get. Heat oil in a thick-bottomed pan. Add cinnamon, cloves and green cardamoms and sauté for half a minute. Add onions and sauté till golden brown. Add turmeric powder, coriander powder, cumin powder and red chilli powder. Mix well. Add tomato and stir. Cook covered till oil separates from the corners. Add the chicken pieces and salt. Sauté on high heat for two minutes. Add two cups water, bring to a boil, cover and cook on low heat till the chicken is fully done. Sprinkle garam masala powder and garnish with coriander leaves and serve hot with Indian bread or steamed rice. Would you like a cheat's way to this wonderful dish? I do it all the time at home when I am running out on some spices or have to plate up in a jiffy. Heat oil in the pan - Add sliced onion, sauté till golden- Add ginger garlic paste and sauté for 2 mins- Add tomato along with turmeric, coriander powder, red chilli powder and 1 ½ tsp garam masala- mix all well and let it cook covered on low flame- when oil starts to separate from corners- add chicken pieces with little water and salt- cook on low flame till done. I sometimes also like to marinate chicken in 2-3 tbsp of beaten yogurt for about 20 mins before cooking. This adds some fresh tangy taste and also mellows down the spices. Chicken can be replaced with cauliflower and potatoes, potatoes and soya chunks or even Indian cottage cheese to prepare vegetarian curries. Add the chilli powder, garam masala powder, salt and chick pea flour to the sliced onions. Onions can also be replaced by thin potato slices, Indian cottage cheese, spinach, bread slices or any other greens that you may fancy. Keep a watch on oil temperature while frying. It should neither be too hot or too cool. 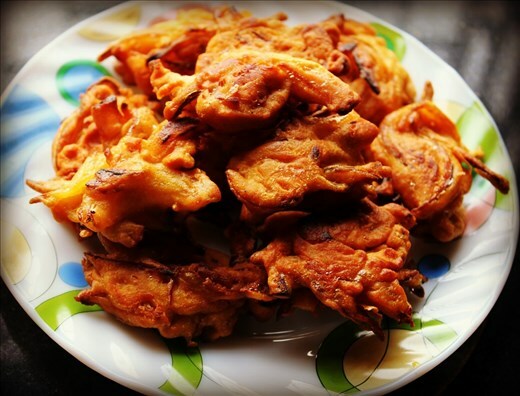 If oil is too hot then the insides of pakoras will not cook properly while the outside will be dark brown and if its too cool then the pakoras will absorb a lot of unnecessary oil during cooking process and will be oil-laden when eaten. Feel free to replace red chilli powder with fresh green chillies (if deseeded- they'll lose all the heat and retain the essential kick) or black pepper powder. Yogurt is yet another item eaten widely across India in various forms. Yogurt compliments most of the Indian dishes and help douse the heat from spices and is sort of a superfood for your guts. Always cook Indian food in layers, one step at a time. Never attempt mixing all spices and ingredients at one go and cooking them in a microwave ! Never go overboard with spices. Stick to the recipe. Spices are meant to lift up the dishes and not overpower them. There are Indian dishes with perhaps just one or two spices and trust me they are as Indian as those using over fifteen spices. Indian cooking is best done on medium or low flame, over long time. Never hurry with them. Richa Gupta, a former fashion business manager is now a travel writer based in India. Her passion for experiential, offbeat and responsible traveling made her take the leap. On her travels, Richa likes to engage with locals, their lifestyles and tries to bring forth their issues through her blog Travels & Stories. In addition, she thinks shopping is stupid and wishful thinking a great pastime.